Orchard Fresh Nutrition : Don't 'beef up' this winter, veg up instead! Let's be honest: frosty mornings, rainy days and cold dark nights don't make exercise the most appealing activity during the freezing winter months. Similarly, salads and light meals become less appealing and we instead yearn for warming comfort foods. Typically these are rich, stodgy foods which are washed down with sweet energy dense beverages such as hot chocolates, chai lattes or endless cups of tea or coffee. And maybe a sweet biscuit or two to boot. Yes, these are warming and comforting foods.... but after months of eating stodgy foods and a staying curled up inside, you may welcome spring with a few extra kilos to your name. The good news? It does not have to be this way!! You can still stay warm, comforted and satisfied throughout the winter months without 'beefing up.' How? Again, it comes down to the veg. Don't veg out during winter; be sure to maintain at least 30 minutes of physical activity each day. Additionally, remember to veg up and pack all your winter meals full of low starch vegetables. You can read more about vegetables and why they are so important for our health in my previous post here. By 'vegging up,' you increase the volume of your meals and consequently increase the fibre and nutrient content whilst keeping the kilojoule (calorie) content lower. The end result: a full belly but a trim waistline! 1. In a large saucepan, bring 2 litres of water to the boil. 2. In another large saucepan, heat extra virgin olive oil. When warm, add onion, garlic, pepper, herbs and chilli and cook, stirring, until onion is translucent. 3. Add lean beef and cook until mince is cooked through. 4. Add can of crushed tomato, diced fresh tomatoes and tomato paste. Cook, stirring, until combined. 5. Add grated carrot and zucchini, baby spinach leaves, mushrooms and canned kidney beans. Stir to combine. 6. Leave bolognese to simmer, uncovered, over medium heat. 7. Add spaghetti to saucepan of boiling water and cook according to packet instructions until al dente. Drain and set aside. 8. 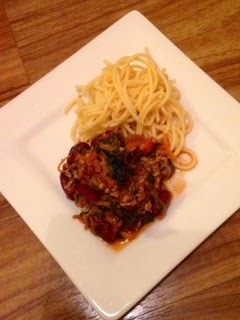 Remove bolognese from heat and serve on top of cooked spaghetti. Top with extra cracked pepper and grated parmesan cheese if desired.